by Deirdre Hahn, Lifestyle Contributor | Remember when you were in school and the frozen sandwich your mom put in your lunchbox also functioned as the ice pack? Great concept, but eating a half-frozen sandwich at noon wasn’t my favorite experience at school. Oh, and those lunch boxes! My third grade Grizzly Adams lunch box elicited a chorus of laughter from my classmates who were sporting new Star Wars boxes. So, for most of my childhood, I was a punch-card cafeteria kid. Salisbury steak, meatloaf, drumsticks, green beans and lukewarm milk ruled my school lunches. Fast forward to 2017, and school lunch food choices have dramatically changed. Some of these changes are driven by federal policy, but many changes are the result of simply knowing more about nutrition and diet. Food allergies or food restrictions are now commonplace in school cafeterias and many kids are “picky” eaters which creates its own challenges. And, let’s be honest, before Pinterest and the Food Network, homemade lunches were simply functional and not the visual works of art that social media promotes today. I’m certain that if I busted out hummus, pita and a rainbow of fruits and vegetables from my Grizzly Adams lunchbox in 1980, I’d wish it was only laughter I was hearing. So, what can kids eat for lunch? 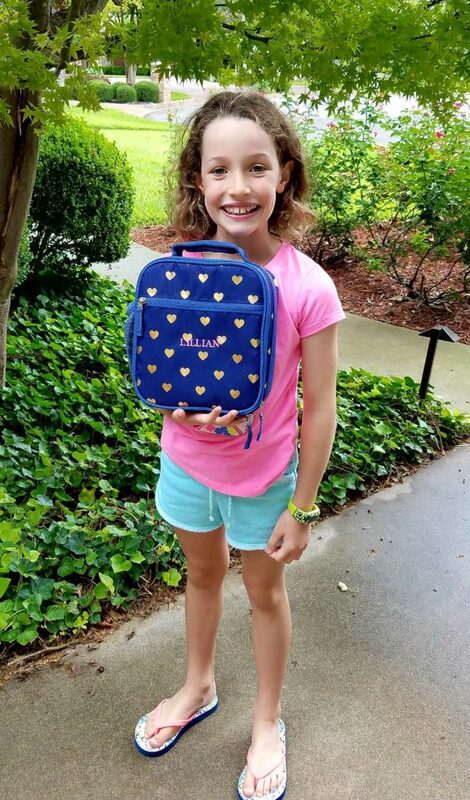 Many kids enjoy being responsible for packing their own lunch. 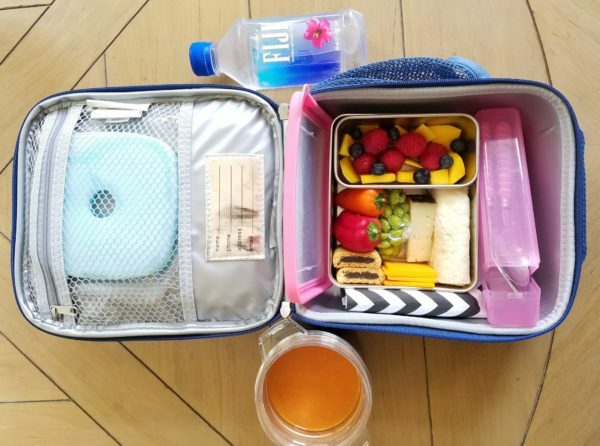 Lilly arranged all the food inside the lunch box in the photo below using a 4-food group placemat from school as her guide for the arrangement. 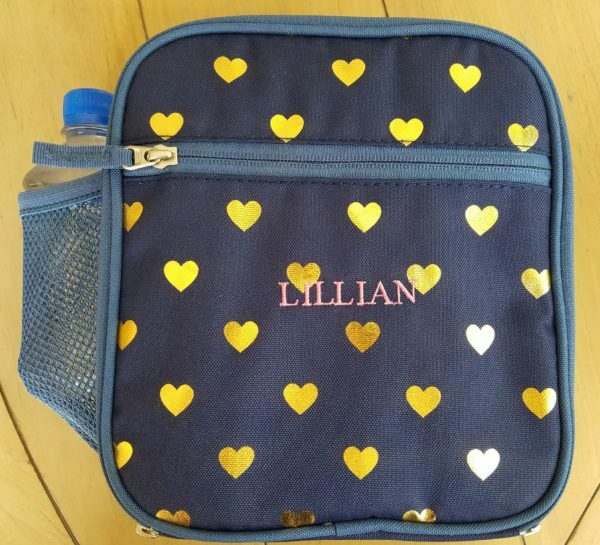 She picked out a new lunch container from Pottery Barn Kids which we need for her daily dive practices. This allows her to eat a late afternoon meal in the car on the way to practice. One final thought…in my experience, no matter the meal, food restriction, or pickiness, there is one certainty I’ve learned about children and food; don’t make a big deal out of new foods! When an adult proclaims “oh, that is soooo good, you have to try it” and, “…it’s soooo good for you”—it’s the kiss of death for that food! Sweets notwithstanding, those statements will get a food blacklisted faster than pulling it out of a Grizzly Adams lunch box. Here are some of our favorite nut-free lunch/snack ideas! We use this chart to create different combinations for Lilly’s lunch. I’d love to hear your thoughts on school lunch ideas! 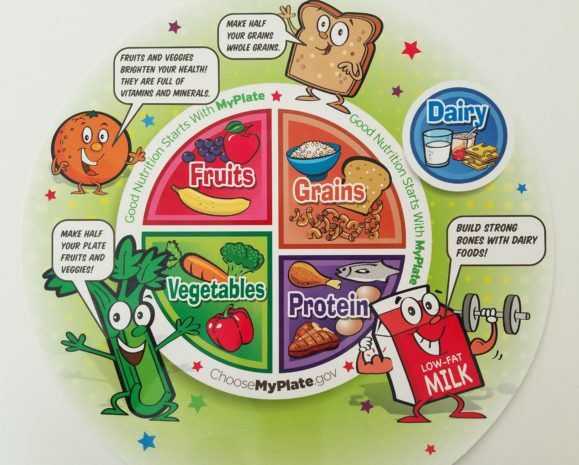 What sort of healthy food and recipes are you putting in your kids’ lunch box? Sound off in the comments section below or send me an email at info@momstylelab.com.